Christmas, Hannukah, New Year — bring on the festivities! It’s the season of celebration…and for most people, it’s also the season of food: Home-baked goods, work lunches, family dinners, cocktail parties — they’re all a huge part of the holidays. But enjoying all the festive eats and treats is a different story when you have diabetes. As someone living with diabetes, I know that finding balance during the holidays can be really challenging. Trying to loosen up and enjoy yourself, while keeping your blood sugar in check, is no easy feat. But managing blood sugar has never been smooth sailing. It’s more like taking the role of captain 24/7 instead of turning on autopilot. With diabetes, it’s essential for long-term health to watch your blood sugar. It’s also the key to feeling good, staying energetic, and being able to actually let go and enjoy yourself! In my 11 years living with type 1 diabetes — with many ups and downs and lots of trial and error — I've been able to find what works best for me to maintain and control my blood sugar, especially during the holiday season. Here are some of my tips that can be helpful for managing both type 1 or type 2 diabetes. This tip is a real lifesaver when it comes to managing diabetes. Get to know your body and how certain foods affect your blood sugar. Sweet potatoes, brown rice, and fruit smoothie-bowls are my everyday staples, so I’ve become really familiar with how much insulin I need to cover these foods. But know that your body’s reactions could be different from mine. For example, I know that for my body, I need a little more insulin when I eat starchy, cooked carbs, as opposed to the same amount of raw, fruit carbs. To learn more about your body, be proactive and get to know which foods cause a reaction. This learning experience is one of the key components to managing blood sugar and will really make your life so much easier. Plus, it means you won’t be missing out on all the fun! The holidays last from November to January. That’s three months of celebrating! But the more you can keep with your routine, the more likely you’ll be able to stay on track with your blood sugar, and in turn, feel your best. Don’t skip meals in preparation for a big holiday dinner. This can cause low blood sugar and increase your chances of overeating later. It’s important to spread your carbohydrate intake throughout the day, and avoid eating too many carbs in one sitting. To manage blood sugar, the ideal amount of carbs is 30-60 grams (g) per main meal and 15-30 g per snack. If you get out of your routine for a little bit, that’s okay. Don’t stress, just try to get back into a routine as soon as you can. Of course, your specific needs will vary based on your height, weight, activity level, and medications, so discovering and keeping your routine is key during the festivities. Like they say, better one time too much, then once not enough — and this definitely applies to testing your blood sugar! When I’m more active than usual, or eating different foods off schedule, I usually test my blood sugar a few extra times just to be on the safe side. Three hour intervals, before eating or before and after exercise, is a must for me, as well as whenever I feel a little dizzy. If you’re going to drink, be sure to have a snack as too much alcohol (with not enough carbohydrates) can cause low blood sugar. If you’ve had a few drinks or have been especially active, I would suggest checking your blood sugar during the night too, as that’s when low blood sugar (hypoglycemia) is common. And always bring plenty of extra supplies wherever you go. This includes test strips, needles, or pump infusion sets, a spare glucometer, and of course plenty of carbohydrate snacks in case you experience low blood sugar. It’s recommended to consume 15 g of carbohydrates and then recheck your blood sugar after 15 minutes. If you’re not in the normal range, eat another snack that has 15 g of carbs. Preparation is the key to success during the holidays. If you’re invited to family or friends for a meal, ask them what food will be served so you can work out the carb content beforehand. For example, you can estimate that one cup of a casserole is about 30 g of carbs, and a two-inch square of unfrosted cake has about 15 g of carbs. Now you can portion your meals accordingly! I also love asking if I can bring along a dish to share, such as a big veggie appetizer that features all the colors of the rainbow, baked sweet potato, roasted pumpkin, or a healthy dessert, such as fruit salad. That way there’ll definitely be some of those blood sugar-friendly, delicious staple foods for you to enjoy with your loved ones. If you’ll be eating at a restaurant, have a look at the menu beforehand, or even call ahead to ask what they could prepare for you. A lot of restaurants have nutrition facts available, so check how many carbohydrates are in the dishes you are interested in. Load up on vegetables, focus on lean meats, and portion out whole grains and legumes. The other option is always to bring your own food or eat before. In my experience, people are always supportive and understanding that I, as someone with diabetes, have some special food needs. Also, if you’re going to be out and about all day, always take some healthy, carb-containing snacks with you. These have (literally) saved my life a number of times when unsuspecting low blood sugar hits. I usually pack fruit, like bananas, oranges, dates, and dried fruit, or oat bars. Remember, staying healthy doesn’t mean missing out! I’m all about replacing rather than removing foods so that you can still treat yourself. Not only does recreating your favorite meals with healthful foods result in better blood sugar control, but it also leaves you feeling great after. There’s no better time to start getting creative and experimenting in the kitchen than the holidays. There is an abundance of healthy, wholesome, nutritious, and delicious festive recipes out there — from Christmas cookies and pumpkin pies, to mash and gravy, casseroles, and salads. This is the most important step of them all. It’s okay to make mistakes, to forget things, and fall off track sometimes. It’s part of life and life isn’t perfect. Be gentle with yourself and remember that doing your best is all you can ask of yourself. The most important thing about this time of year is that you can enjoy the festivities and the company of your loved ones. Believe in yourself and show yourself the unconditional love, self-care, and nourishment you deserve! And enjoying yourself and the company of loved ones is, coincidentally, something you can do with Christmas cookies. Scroll down for my favorite snack: Raspberry-jam filled thumbprint cookies. This is the recipe for my favorite Christmas-themed snack, raspberry-jam filled thumbprint cookies. It’s free of refined-sugars and oils, made from whole foods, and still super tasty! Warm the raspberries with the vanilla in a pan and simmer, stirring for 5 minutes to absorb the watery liquid. Stir in the chia seeds and set aside for 15 minutes to allow to thicken to a jam consistency. Mix the buckwheat flour, oats, flax, baking powder, ginger, and cinnamon in a bowl. Add in the applesauce and vanilla, mixing well to make a sticky dough. You might like to use your hands for this and turn it out onto the surface of your kitchen bench to form the cookie dough. Shape the mixture into 12 golf ball-sized balls and place onto the baking tray, then use your thumb to press them down into cookies, making a thumb-sized indent in the center. Fill each indent with raspberry jam. Bake the cookies for about 30 minutes until golden. Place on a rack and allow to cool. Enjoy! 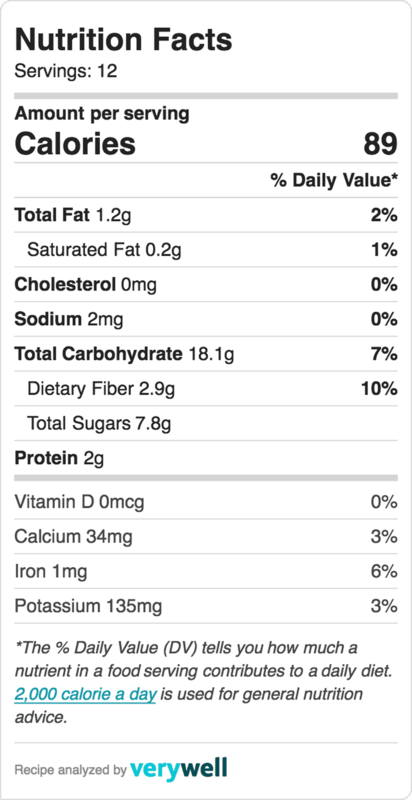 And in case you were wondering, here are the nutrition facts for one cookie. If you choose not to add date paste or maple syrup, the carb count would actually be 15.9 g per serving, making this cookie a perfect carb snack for keeping your blood sugar in check. I hope you’ve been able to take something from this article, and most of all, I hope your festive season is the best yet! Nina Gelbke is a Swiss-Australian who has type 1 diabetes, is a health blogger, and is in her final year as a Nutritional and Dietetic Medicine student. Her passions lie with all things related to health, well-being, and nutrition, which she shares with the world through her Instagram and blog. Her aim is to inspire, empower, and educate others into nourishing their body, mind, and soul with wholesome and delicious food, self-love, and a compassionate and active lifestyle.